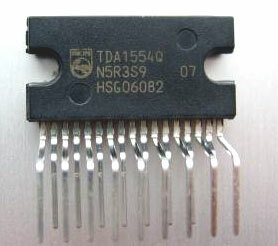 IC TDA 1554 Q is a class B output amplifier IC in a 17 lead single in line package. The IC contains 4 x 11 Watts single ended or 2 x 22 Watts Bridge amplifiers. IC TDA 1554Q is mainly used in Car Stereo Amplifiers and requires only a few components to make a good quality Stereo amplifier. It works off 12 to 18 volts DC which can be derived from a 12 volt 2 Amps power supply.